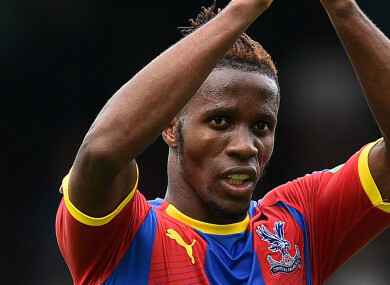 WILFRIED ZAHA HAS revealed that he has received racist abuse and death threats after winning the penalty that earned Crystal Palace a 2-2 draw against Arsenal at the weekend. With the score at 2-1, Zaha ran at Granit Xhaka and bamboozled the Switzerland international with a series of stepovers, with the makeshift left-back diving into a late tackle. The Ivory Coast international was felled, with the referee pointing to the penalty spot, from which Luka Milivojevic scored his second spot-kick of the game. The goal drew to a close the Gunners’ run of 11 straight victories, and Zaha has now claimed on Instagram that he has been sent vile abuse as a result. He wrote: “”For all the people taking it one step further and being racist and wishing death on my family, I wish your families the best too. Xhaka admitted after the game that he had fouled Zaha, accepting that he gave the referee a decision to make. “It’s difficult. I think it’s a clear penalty,” he said. “I touched him in the knee. Zaha has enjoyed a productive season thus far under Roy Hodgson, scoring three goals and providing two assists. The Eagles are currently 14th in the Premier League, three points above the relegation zone. Arsenal, meanwhile, are fourth, four points behind leaders Manchester City. Email “Wilfried Zaha reveals racist abuse and death threats”. Feedback on “Wilfried Zaha reveals racist abuse and death threats”.